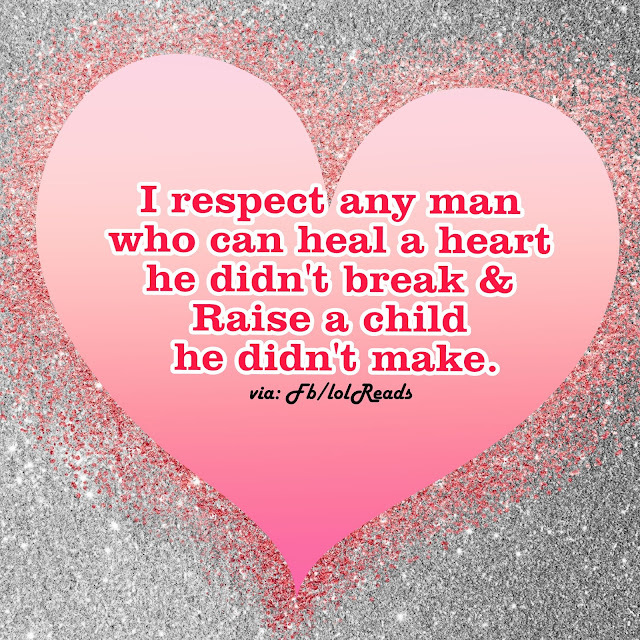 I respect any man who can heal a heart he didn't break & Raise a child he didn't make. It takes a man big man or at least a mighty big heart. They are very respectable things to do. And as long as they are genuine with no hidden agenda should be appreciated. Thank GOD for those who commit and stay committed till death separates them. It goes both ways though. Being a single mom is hard work but for right now thats all we know depending on a man to be there. Prove it! My dad was one of those men. He loved us like we were his own and told everybody that we were his own to this day...! dad I love you so much and I miss you terribly. An honorable man with mighty big heart picture/image is an Inspirational Stuff to Inspire and Motivate You. You can download pics by just clicking on the Images. Thanks for visiting Truth Follower an online place for huge collection of inspiring pictures, quotation, and Sayings Images. If you like An honorable man with mighty big heart, Please Share with friends and family on Facebook, Twitter, and Pinterest.